As of 2016 you can see from this graph that renewable energy for a lot of Europe really just means wood. The red bar is woods percentage of renewables. 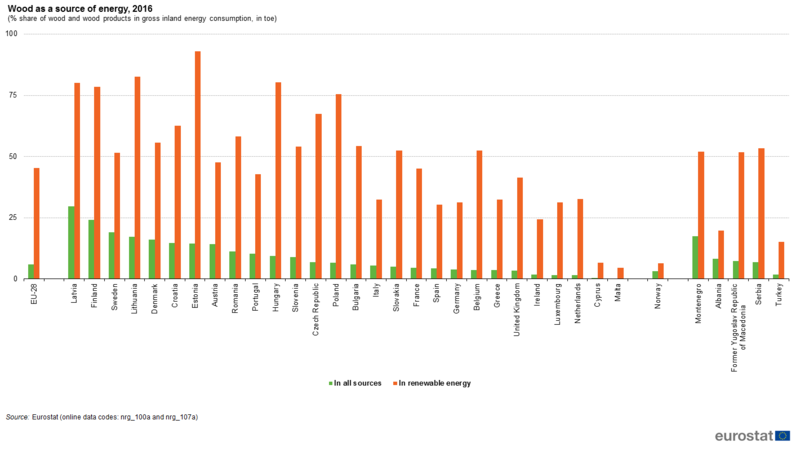 The green bar is wood share of total energy. For example, Estonia gets 90% of its renewable energy from wood. Green energy means killing trees. In April 2018, representatives from the international forest movement gathered in Estonia to discuss the protection of forests and peoples’ rights. While there, they learned about the serious threats to Estonia’s forests. One significant threat to forests is a planned biorefinery close to Tartu, in the east of the country. The biorefinery would use a quarter of Estonia’s annual wood production (approximately 3.3 million m3 of wood), and the impact on the environment is immense: between 2001 and 2015, 285,000 hectares of the country’s forests were lost, despite warnings from the Estonian Academy of Sciences that the logging was compromising healthy and resilient ecosystems. For example, habitat for several birds and the flying squirrel, a species protected by the EU Habitats Directive, decreased significantly. While the national government continues to ignore local resistance against the biorefinery project, the international forest movement published a statement supporting the people of Tartu in their fight to have it stopped. The expansion of the biorefinery and other ongoing projects in Estonia are a perfect example of how the EU’s renewable energy directive (RED) can backfire. The EU allows its Member States to subsidise the production of energy from wood, and Estonia has taken this seriously: between 2009 (introduction of the RED) and 2016, renewable energy production from wood grew by more than 65 per cent, accompanied by an ominous increase in logging. This has also negatively affected Estonian forests’ role in mitigating climate change: between 2005 and 2030, it is projected that the country’s forests will turn from a sink into a source of emissions. Currently, Estonia already harvests 90 per cent of its annual forest growth. Estonia plans to ‘trade’ a surplus of its renewable energy with other EU countries. But the EU should be warned that this comes at the expense of a considerable forest and climate deficit.